Mathura ke Dubki wale Aloo is a traditional spicy potato recipe from the streets of Mathura, a small town in Uttar Pradesh. Here is how to make dubki wale aloo ki sabji. 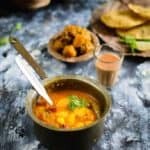 Mathura ke Dubki Wale Aloo is a lip-smacking accompaniment that is popular as a street food and also for a homely meal. After spending almost a major time of my life in Uttar Pradesh, I have got the chance to visit mostly all of the major cities in the state. Mathura famous as the birth place of Lord Krishna was among the ones which I visited when I was very young. 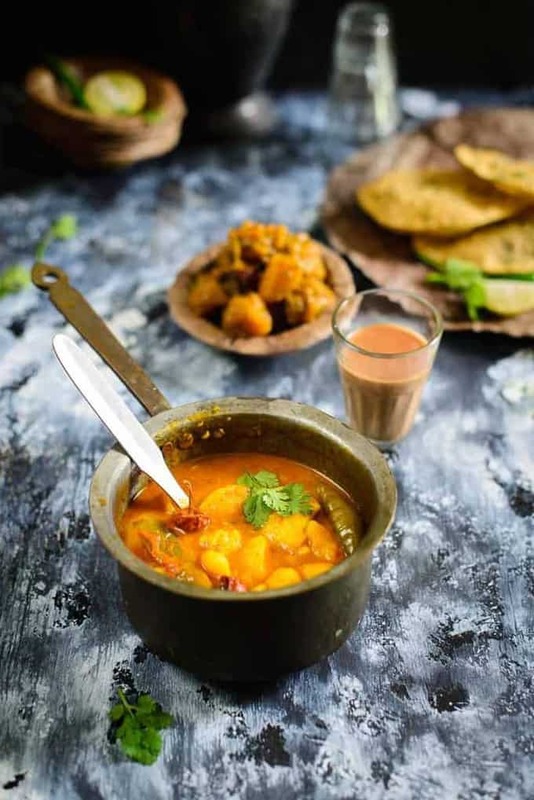 Although the memories of the city have faded but what stayed is the lingering taste of this spicy potato curry served along with khasta kachori on the many stalls that lined the city’s roads. 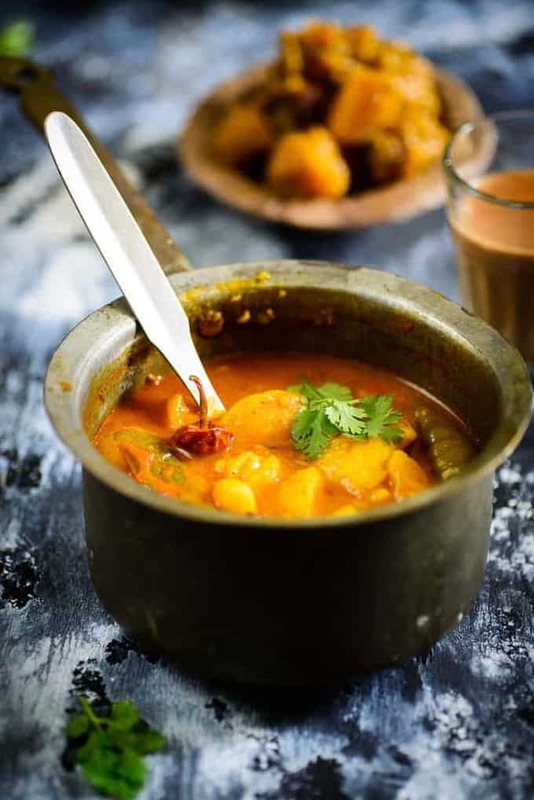 The thin, almost watery curry with chunks of potatoes totally soaked in the flavors of the spices, is definitely a dish to remember. My mom makes this Mathura ke Dubki Wale Aloo very often and served it along with poories, kachories and Aamras as well during summer. An addition of methi seeds gives this curry a very distinctive taste and I think this is what differentiates Mathura ke Dubki Wale Aloo from the regular potato curries that we get else where. Methi seeds are soaked for a few hours and ground to make a coarse paste. This paste is then added to the masala along with other spices. The curry is simmered for a long time, so that the potatoes soak in all the flavours and nicely gel with the curry. Soak methi seeds in little water for 3-4 hours. Drain the water and grind the seeds coarsely. Break the potatoes into small pieces using using your fingers. When the oil is hot, add heeng, zeera, methi seeds, saunf and dry red chilies. Add the potatoes and green chilies. Add turmeric powder, kashmiri red chili powder, garam masala powder and salt. Add 4 cups of water and bring the curry to a boil. Mix maida in little water and add it in the pan. Let the curry cook for 20-25 minutes on low flame. Add amchoor powder and mix well. 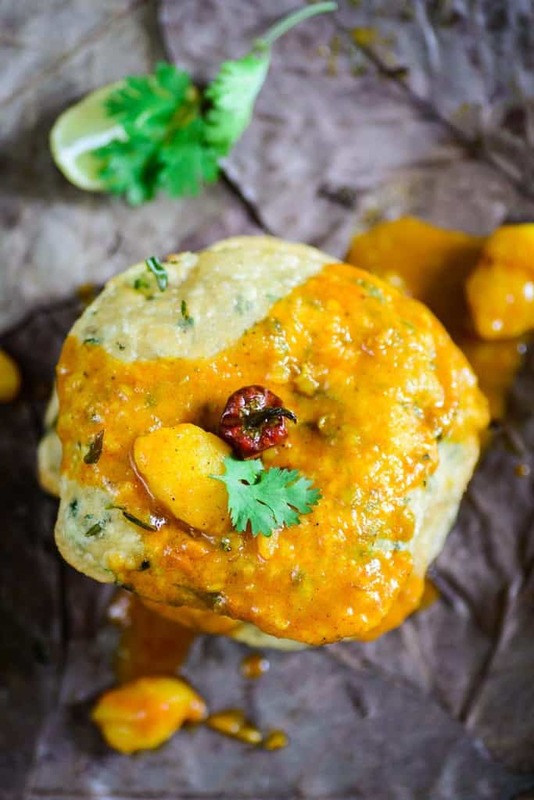 Serve hot with khasta kachori or Poori. OMG Neha, my mouth is watering. I actually have tasted this recipe in Mathura and always wanted to try it.Thanks so much for the recipe. will corn flour work instead of maida? Is this to thicken the gravy? Yes you can use Cornflour. It is to thicken the gravy.